Last week was big for me, as I finally met Taxi Mike in person. 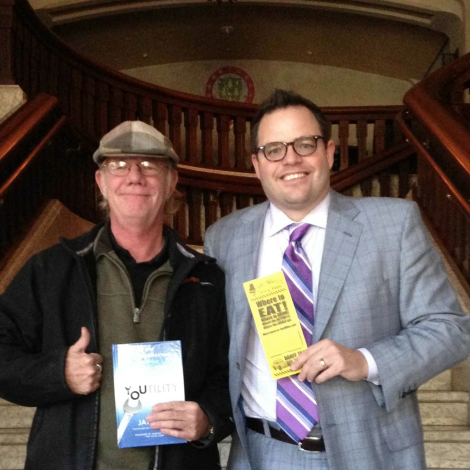 I first found Taxi Mike and his content marketing prowess 3+ years ago, and he was the original inspiration for my best-selling book, Youtility. But I’d never met the man until this week, when I returned to beautiful Banff, Alberta to deliver a presentation on Youtility to Travel Alberta. I was honored to shake Mike’s hand, give him a signed copy of the book and a special Youtility T-shirt. What makes Taxi Mike a special content marketer? Banff is a big ski town. It features soaring mountains and glistens with bars, restaurants and tourists galore. There are, of course, many, many taxi drivers in Banff, but Taxi Mike is the only one that builds his business with Youtility. Four times per year Taxi Mike puts together the “Taxi Mike Dining Guide: Where to Eat in Banff.” It’s a very simple, 8.5 x 11 piece of bright yellow paper, printed on both sides. It’s not what we’d classically consider to be “great” content, but it’s incredibly effective because it’s hyper-relevant. Taxi Mike updates his guide every quarter with his latest recommendations for best sports bar, hottest nightclub, best place for cheap drinks, and more than a dozen other categories. Taxi Mike makes a few hundred copies, folds them into thirds like a rack brochure, and delivers them to every restaurant, hotel, bar, or tourist establishment in the area. You’ll see them on counters all around Banff, and if you don’t see one in a particular place, just ask. They have them behind the bar, guaranteed. They want to hand them out because Mike’s information is accurate, and just about every place is listed in Taxi Mike’s guide somewhere. He is a one man Trip Advisor. At the end of a night in Banff, when you’ve been to six or eight of these places and you think, “Wow, I really should get a cab home,” are you going to walk out on the corner and just raise your hand? No. You’re going to reach into your pocket and see the crumpled up, bright yellow piece of paper that has the map of downtown you’ve been looking at all night that says, “Taxi Mike – 760-1052”. And he’s such a Youtility, he also does computer repair. Simple. Useful. Helpful. That’s Taxi Mike. While preparing new Youtility case studies for the Travel Alberta event, I stumbled across Mike Morrison and his Instagram video for Glacier Skywalk. Opening in May 2014, the Glacier Skywalk (2.5 hours from Banff) will enable visitors to walk out on a glass-floored observation platform perched 918 feet above a glacier-filled canyon. The glass deck was recently installed, and the owners of the Skywalk invited Mike Morrison to investigate. Mike runs MikesBloggityBlog, a popular travel and entertainment blog in Canada. The resulting Instagram video perfectly captures – in just 15 seconds – the thrill (and perhaps terror) of walking out over the canyon. A blogger + iPhone + 15-second video = content marketing success. Sometimes that’s all you need, as this video is now being prominently featured on the Glacier Skywalk website. Don’t fall into the trap of believing content has to be complicated, comprehensive, or polished to a fine sheen to work for your company. That’s one way to do it, but you can also use Cooperative Content, or you can use less-polished, short form content like Taxi Mike and Mike Morrison.